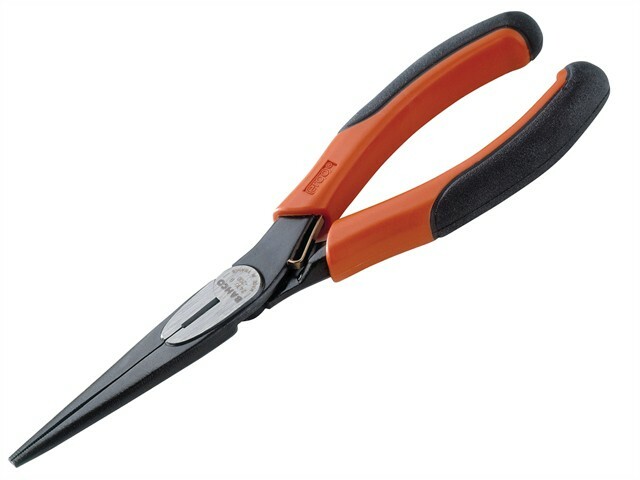 Bahco Long Nose Pliers developed according to the scientific ERGO™ process. The handles allow the vast majority of users to apply the greatest possible force with the least possible effort by combining hard polypropylene for the core and a softer elastomer for the surface. This combination of materials provides a firm, non-slip grip for the hand. Have serrated jaws, and they have a black oxidised and anti-corrosion treated finish. Tips give good grip and improved accessibility in confined spaces. Sharp edges for cutting softer material such as copper and plastic insulated wire.